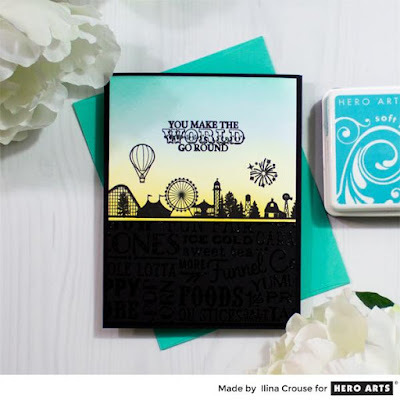 Creativity Within : Hero Arts: July My Monthly Hero Blog Hop, Video and Giveaway! 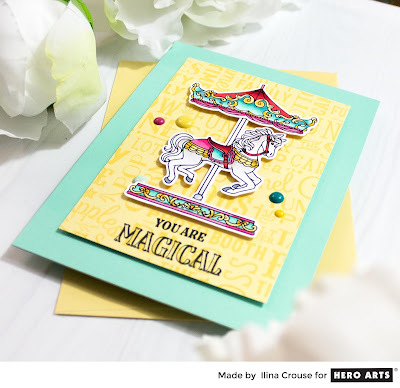 Hero Arts: July My Monthly Hero Blog Hop, Video and Giveaway! 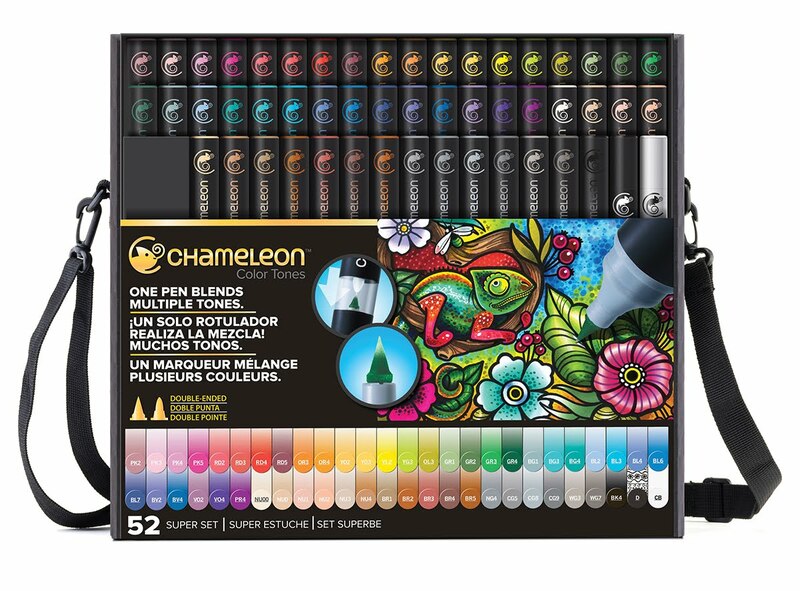 This kit is valued at $70, but is an incredible deal at $34.99. It is available in limited quantities - grab yours before they are gone! We also have several optional add-on products this month four clear stamp sets, three coordinating Frame Cut sets, one Stamp and Cut set, one Frame FamcyDie,one Bold Prints background cling stamp, and another new addition to our Liquid Watercolors line - Pink! You can also purchase all of the add-ons as a bundle, at a savings to you. Next up are few cards using the main kit and lots of strips. Please watch the video below on how I made these cards and how you can get most of your scraps. Then, I have this cute County Fair Pig card that I did white on white. 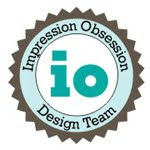 I started by stamping the image on white card stock with intense black ink. Colored with copics and die cut. Next I die cut bunch of clouds from vellum and adhered to my white panel. I stamped the sentiment and adhered the little pig. EMbellished with enamel dots and adhered to snow note card. 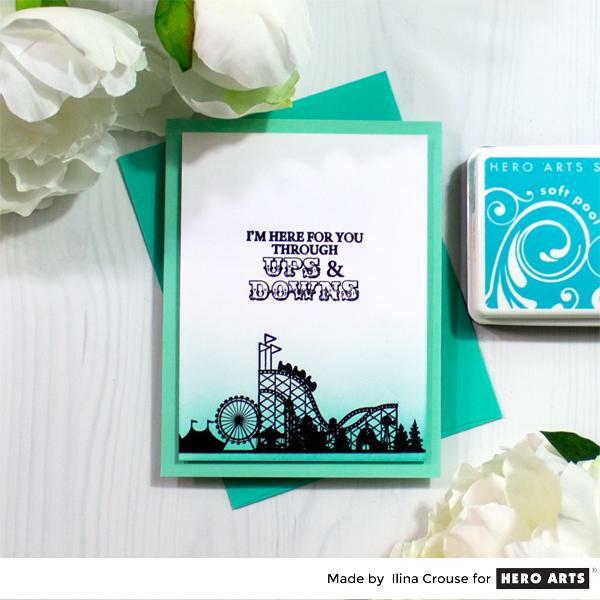 Last but not the least is a card using the Ornate Carousel and the County Fair bold prints. Kit availability and shipping: The main kit is available for a limited time only - once it's gone, it's gone. 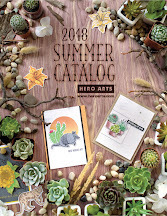 Kits begin shipping from Hero Arts on Friday July 6th. Amazing cards!! I love the pig card!! SO MANY amazing card! Love your style. Thanks for sharing! These are all wonderful cards, but I especially like the ones with the colorful striped backgrounds. That’s one of my most favorite techniques. I use it often. Thank you for sharing these. Such cool cards. 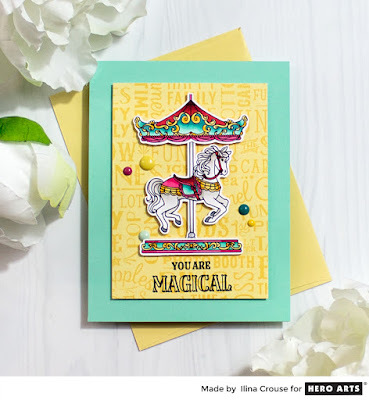 I really like the carousel horse one! The baby pig is SO CUTE!!!!!!!!!!!!!!!!!!!!!!!!!!!!! technique. That little pig is adorable. Thanks for sharing your inspiration and ideas. SO many beautiful cards! I love the method of using your scraps to make those gorgeous stripes. The colors are so very bright & summery! The ink blended backgrounds are fabulous & last but definitely not least the carousel horse + the lil flying piglet. STUNNING!! Such fun, colorful cards. Luv them all - especially the coloring on the carousel horse! Cute cards! I liked your sneak peak cards, but the striped backgrounds & bright colors on the others are my favorites. Love how you did the striped background. Nice colors! The flying pig card is so cute too! Love your color choices! Great cards! And the piggy is so adorable! Wow, love your customized stripes! Great cards. 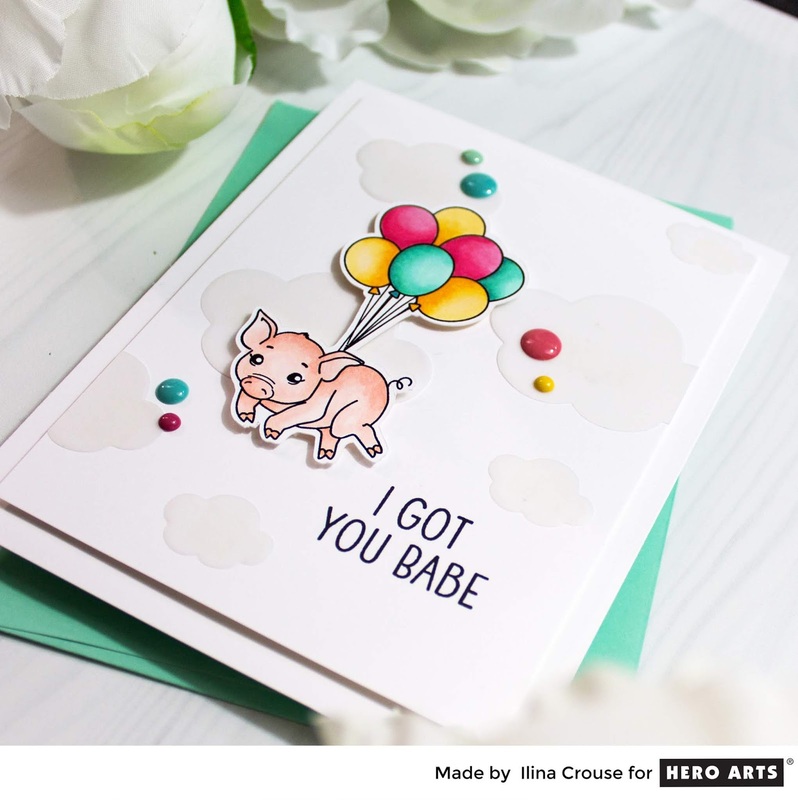 Your flying pig is so cute! I also love the coloring that you did with the ornate carousel, it is beautiful. Gorgeous work! Your cards are beautiful ! Your backgrounds make them very happy. Such lovely cards! The piggy w/balloons is so cute! 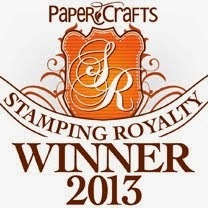 And I love the gorgeous BG stamp. 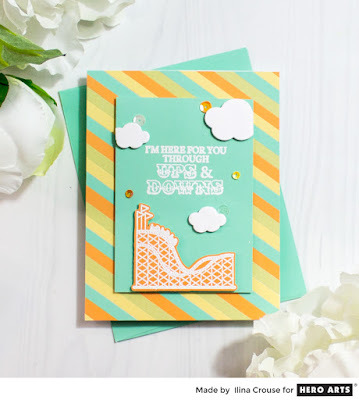 Love all of the cards especially the ones with the colorful backgrounds you made with strips of cardstock. Love your cards. My fav are the top two and the piggy’s. Great color combinations. Plus a great use of scraps. Have a great day. 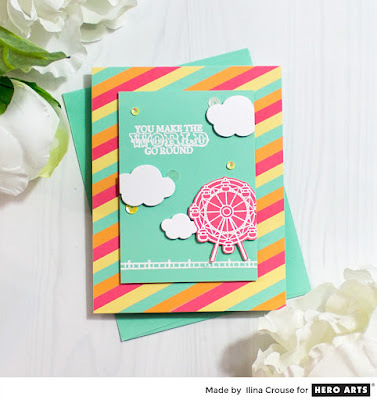 Great cards - love the striped backgrounds! Thanks for sharing your technique video with us. And the new kit looks like another winner from Hero Arts! WOW AMAZING CARDS! Just ABSOLUTELY GORGEOUS! I LOVE all the colors and layers that are going on with each card! You are just soooo very talented!!! Wow! Lots of great cards! I love the color combinations you used on all the cards, such fun. 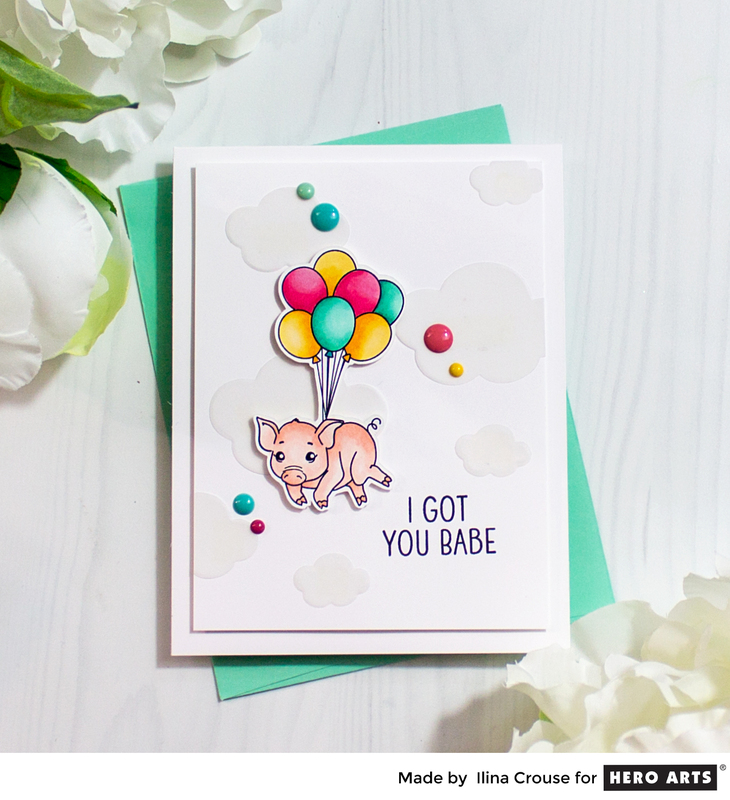 The "babe" card definitely steals my heart LOL, that is just adorable! Wonderful cards! Your backgrounds are stunning on the first cards. I love the colors and whimsy in the last cards. I love making the striped backgrounds with my strips, but never thought to use Stick It. Thank you so much for the tutorial! Love your cards! The backgrounds were awesome. Thanks for sharing and have a great week. Oh my goodness, I can't even begin to pick a favorite card out of all of yours because they are all so fabulous! I am going to try making a striped background like yours. Thank you for sharing! 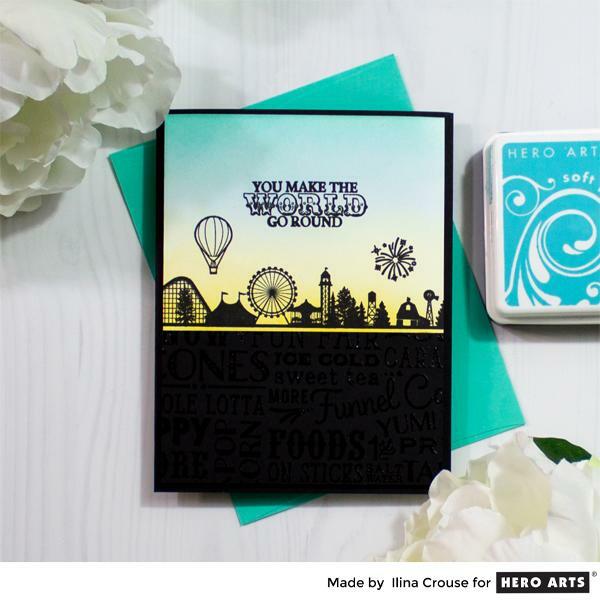 What a whole lot of fun, colorful cards you made! My favorite is the carousel horse one! I like how you used the stripes in different ways for your background. Well done. Great cards, all of them! Thanks for sharing your wonderful video!! I can't believe how many cards you made! They are all amazing. 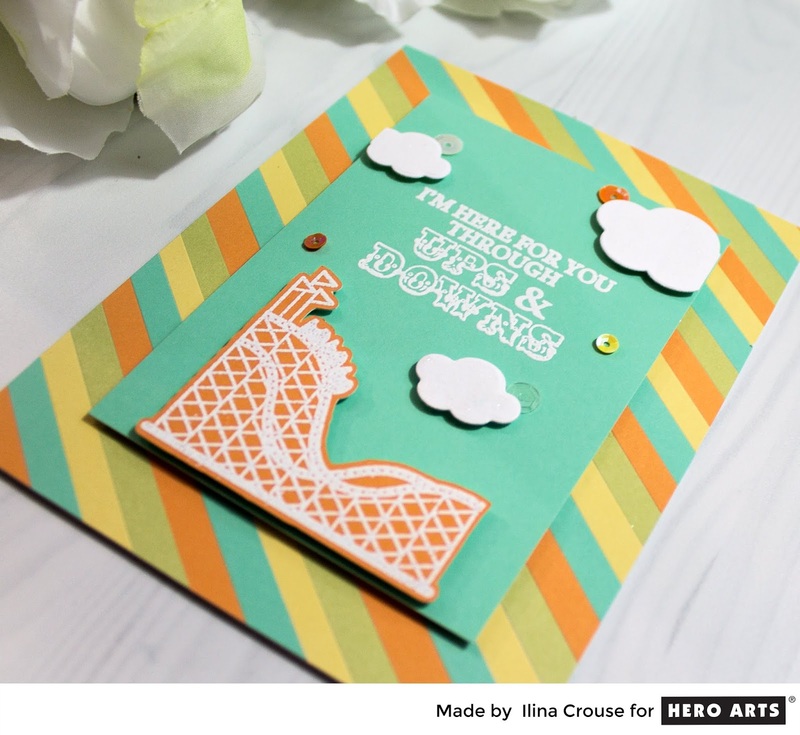 I love the colored skylines on the first few and then I like how the stamping coordinates beautifully with the card stock colors. Your cards are amazing! 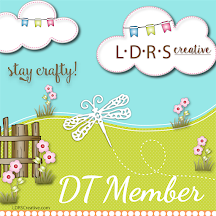 I love the stamps and dies! Can't wait to order them. Beautiful cards! Love the striped backgrounds! Thanks for sharing your video. These are beautiful. I love the pig! I'm in love with this kit. That flying pig is so cute. This is a spectacular kit and I love your card creations. The pretty striped backgrounds look like so much fun to make - will have to try the technique. 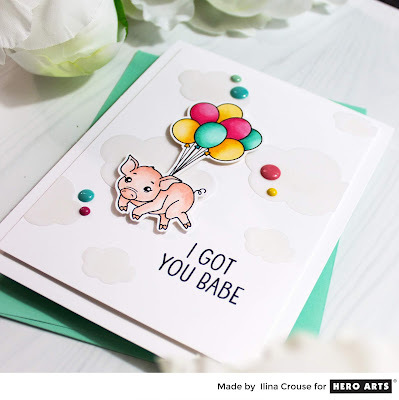 The flying pig is my favorite - so very cute! Wow, you have some awesome cards here, I loved them all!! Great job! Lovely cards! The one with a piggy is so cute! 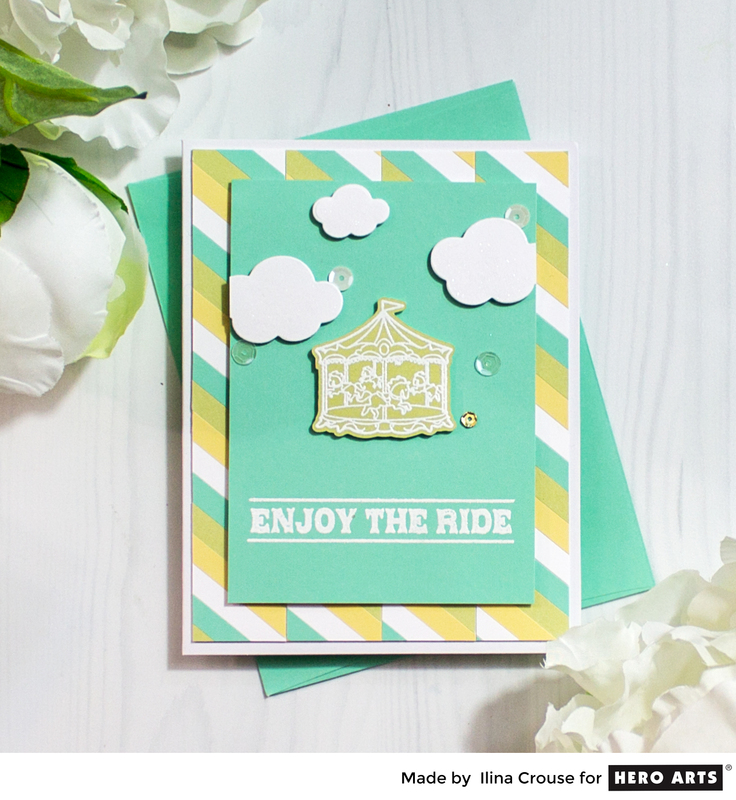 Fun & pretty carnival cards from wonderful silhouette of b&w with colored backgrounds & more. I got you babe is my favorite! I'm consistently blown away at the number of gorgeous/clever projects you create for the MMH kits. You're amazing. Gorgeous cards. You've really shown the versatility of this release. I love this kit, and the add-ons are wonderful. I Got You Babe. Yes, indeed! Adorable! Oh the colors!!!! All your cards are awesome! 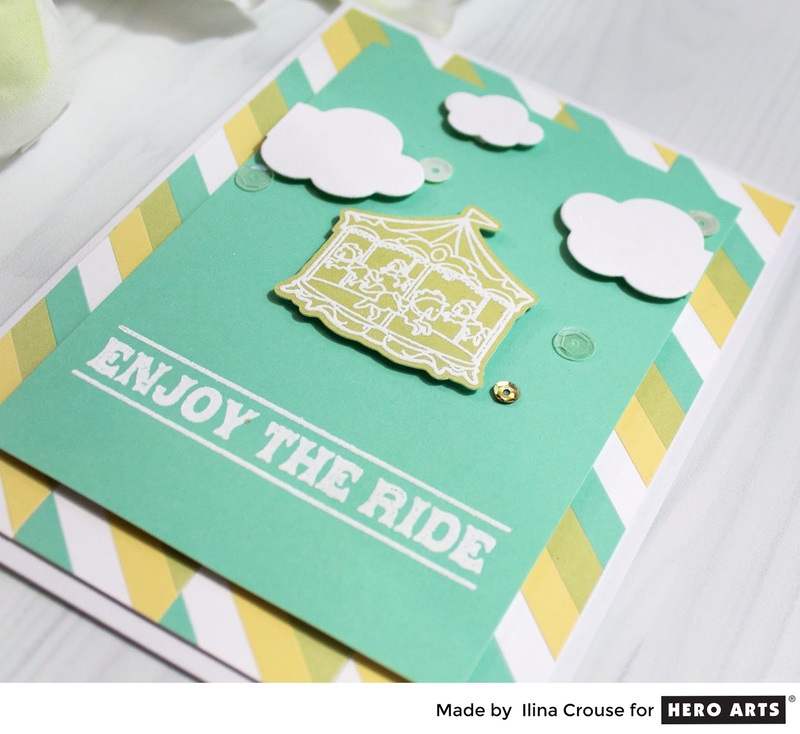 Love this theme & the cards you made showing some of the different stamps in this kit. Love each one of your cards! So much fun! Wow! You really did a lot of work for your cards but they're all beautiful! I love the first one with the sun setting and the pig card is so cute! Thanks for all the inspiration! All of your cards are awesome. I think I like I’ve Got you babe the best. Beautiful cards! I love the design of the first one! 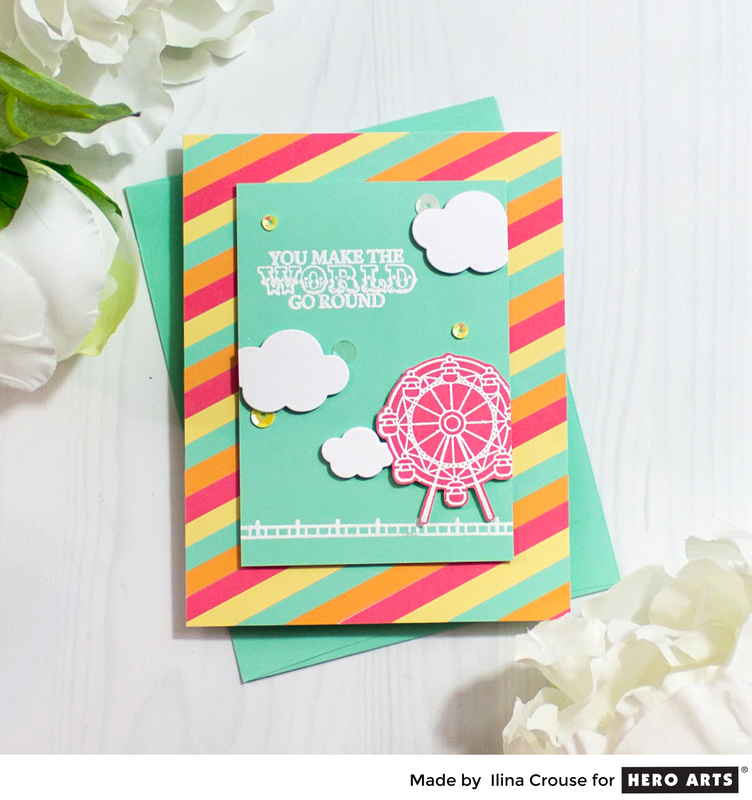 OMG all the cards are so cute and I love finding ways to use scraps! 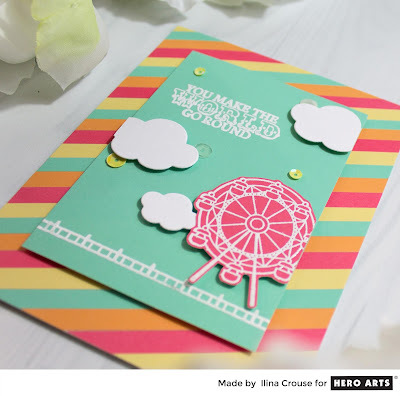 Wonderful and cute card designs with this kit. Love the colors. 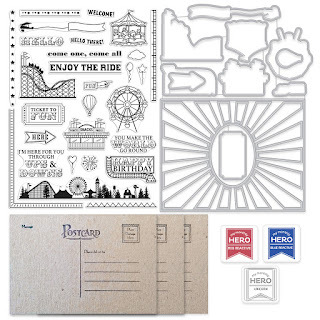 LOVE all the different designs that you made with this fun kit! The piggies are adorable and that blended sky background with the fair silhouette is beautiful. Your ink blending on the first couple of cards is lovely and I really love how bold the colors are on the other cards. My favorite is the carousel animal card. I love the variety of cards. They are beautiful. 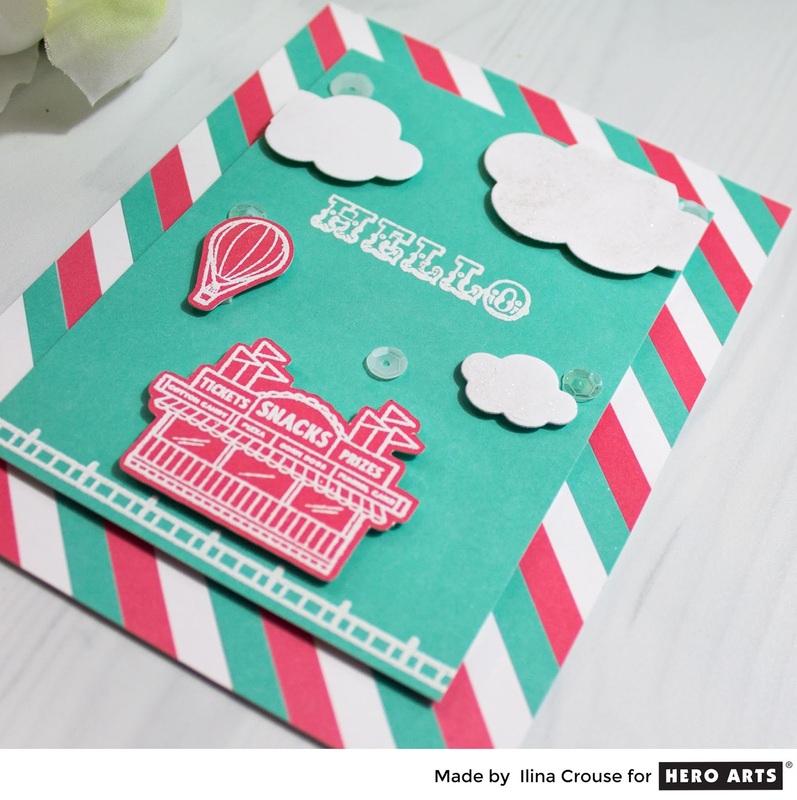 I love how you used up your cardstock scraps! I do that, too! Fabulous cards! The inked backgrounds are amazing! Thanks for sharing your talent Ilina! Wow! I love how many different looks you came up with! YOU DID AN AMAZING JOB!!!! These are such beautiful cards and so creative for us to be inspired by! Thank you for your fabulous inspiration! Wonderful cards--this kit is awesome! Beautiful stripes and sentiment of the ups and downs with the roller coaster should make anyone smile. Your cards are so gorgeous! They very first one i my favorite from the entire hop! It is just so beautiful, and reminds me of a summer carnival just as the sun is about to set! Beautiful! Thanks for this BEAUTIFUL inspiration! Wonderful cards! Love the pig card!! So cute and fun! The pig reminds me of Wilbur! I love the silhouettes the most! Great cards! Love the colorful background strips. Another amazing release. Just stunning. Great patterns, colors, and designs. I just love them all, so fun. Great use of color! So bright and fun! Thanks for the inspiration! 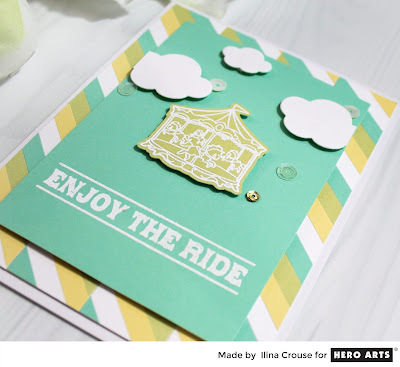 All those striped backgrounds look really fun and the colors are great for a fair theme. That little piggy is so cute. Nice coloring on the Ornate Carousel card.